Create safer and softer floors with our Wood Grain Reversible foam tiles. 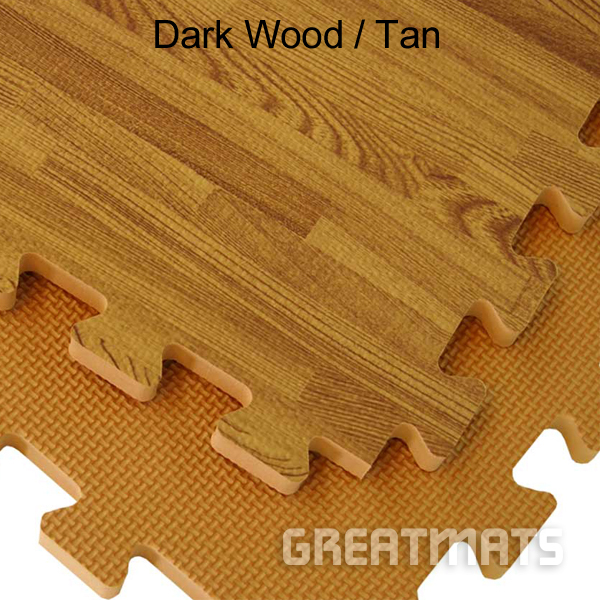 Introducing a new, super durable wooden grain interlocking foam floor tile with a reversible design. 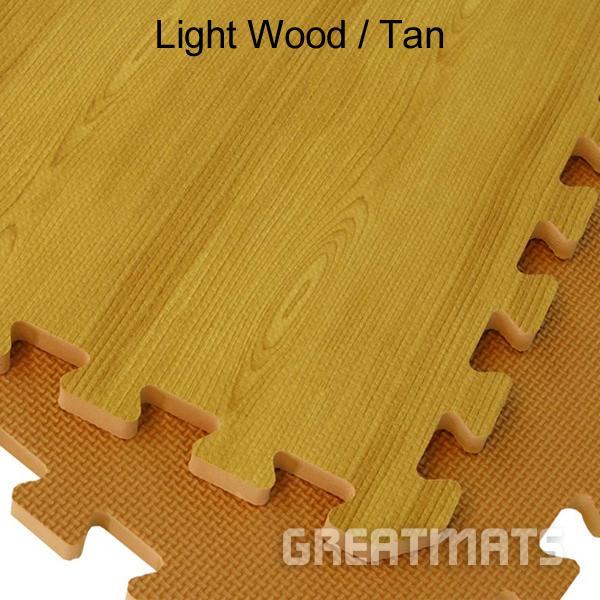 It features a tan thatch texture on the bottom side of this foam mat that doubles its usefulness and lifespan. Reversible option allows you to put the wood grain or tan thatch side up. Both sides will interlock. Choose the oak wooden grain look or the tan texture or both. You can lay this floor in your basement, kid’s room, or family room. These foam mats come with two border strips per tile and the foam tiles are easily cut to fit for wall to wall installations. Each tile measures 2×2 feet and 5/8 inch thick. 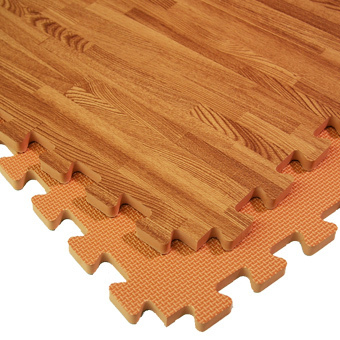 Installation couldn’t be easier with Wood Grain Reversible interlocking foam tiles. Like a giant puzzle, you simply piece the interlocking edges together. For complete wall-to-wall installations, you can use the border strips or just cut the tiles to fit with a sharp utility knife. These floor tiles require no glues or tape to install so you can easily take them up and move them whenever you like. The tiles are lightweight and simple to transport. These foam tiles are a closed cell EVA foam which is very rugged as well as waterproof. The tiles are lead and latex free so they are ideal for almost any area including playrooms, entrance areas, or family rooms. Soft foam flooring provides fatigue relief. Cleaning this flooring is easy. Simply vacuum or mop with a damp mop and you’re done. This foam flooring will last for years. It comes with no odor and acts as a great insulator from both temperature and sound. 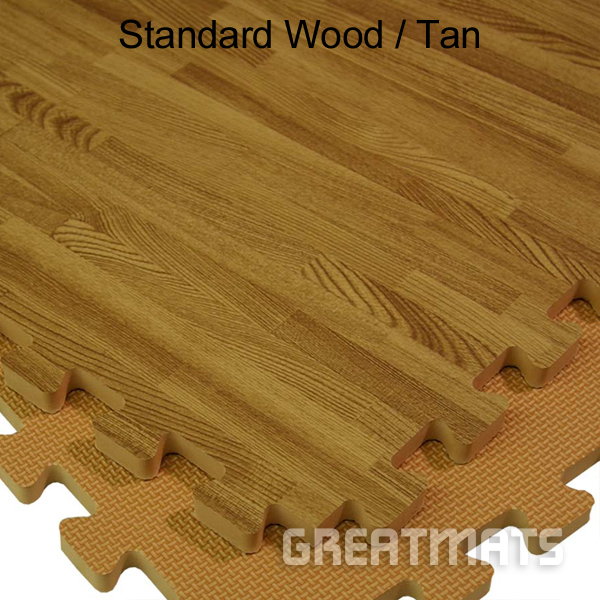 This wood grain foam floor tile will ship via ground delivery service directly to your door.